What we feed our cats is very important, but more and more we are realizing how we feed them is just as important. Believe it or not, how we feed our cats can affect them physically and emotionally. Boredom, frustration, and environmental stress are some of the most common reasons that cats exhibit behavior problems. This same boredom combined with high calorie, easily available food, can also lead to obesity. We strongly believe that encouraging foraging behavior for our feline friends is one of the easiest things you can do for your cat to help combat these problems! Using puzzle feeders and even hiding kibbles around the home increases activity, and provides mental and physical stimulation. There are many types of puzzle feeders you can buy, or easily make at home. Puzzle feeders vary in their complexity, can be motionless or rolling, and can be designed for dry or wet foods. Initially most commercial puzzle feeders were balls that when your kitty pushed it along the floor kibbles would drop out. This is alright for some, but what about the kitties who would rather stick their paws into something and scoop some kibbles out instead? Thankfully there are now many different designs readily available for clever kitties. 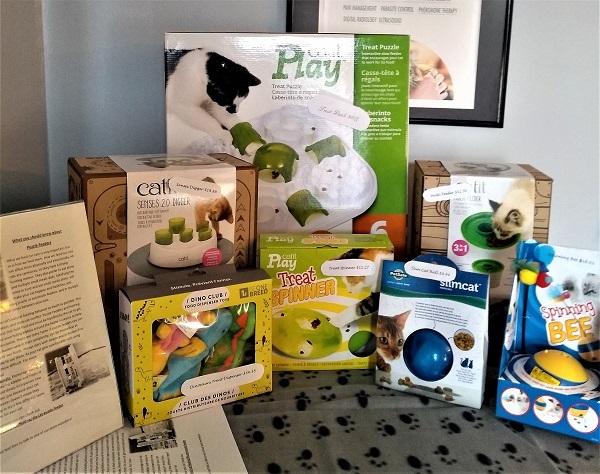 Trying a few different DIY models to find out which style is best suited for your cat’s preferences is a way to give you a direction without breaking the bank. 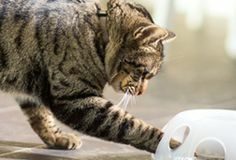 Check out https://www.purina.com/articles/cat/feeding/diy-cat-puzzle-feeder for some different examples. 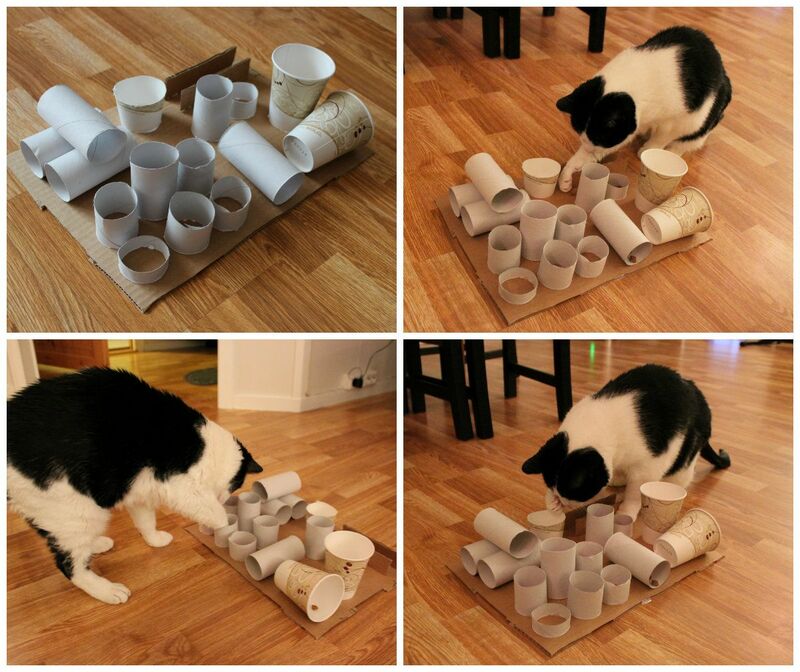 Always start with simple puzzle feeders first because your cat needs to learn how to use them. As your cat gets comfortable with using them, you can slowly make them more difficult. For more information on puzzle feeders, visit www.catfriendly.com/howtofeedcats. “Puzzle Feeding” doesn’t have to be complicated. You can encourage your cat to hunt and forage for food by placing kibbles and treats in different locations of your home. Or get a muffin pan, put kibbles in the bottom and then hide the food by putting small toys on the top. We just want something that takes more effort than the traditional bowl. Be patient and slowly incorporate new feeding methods. Also remember that just because your cat doesn’t “take to” one type of feeder doesn’t mean they won’t like any at all. Be willing to try a few different types until you find that purrfect one for your cat. If you have questions please feel free to talk to one of our team members! We have a variety of different styles available for your convenience.